What Is So Special About Poland? The Center for International Studies at ETH Zurich hosted a number of lectures on Thursday March 8, 2012 focusing on Poland and European integration. This was an excellent opportunity to learn about and discuss several important topics presented by Polish scholars, covering the following four themes: how Polish euroskepticism has changed over the past decades (Krzysztof Zuba); how differentiated integration might play out in the case of Poland (Paweł Frankowski); how the European Parliament socializes its Polish members (Anna Paczesniak); and, what distinguishes European parties from national parties (Wojchiech Gagatek). More broadly, however, what is there in particular that distinguishes the case of Poland from that of other new member states? Even after the lectures, the answer to the last question remains unclear. On the other hand, the presenters provided the audience with a feel for Polish political dynamics and how this ‘new member state’ relates to Europe. 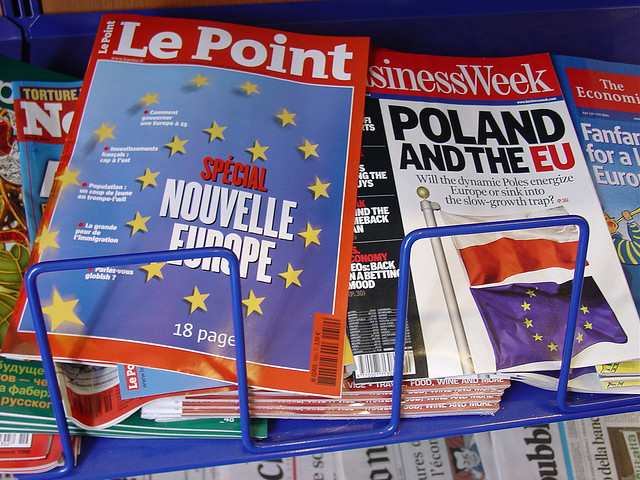 Zuba framed Polish euroskepticism by drawing a parallel between its domestic political significance and the stages of European integration: aspirant, candidate, and member status. Using – but at the same time criticizing – the Eurobarometer’s quantitative data, Zuba examined how euroskepticism rose to the heights it did during the Polish candidacy period and how it has since lost most of its resonance among the electorate and the parties. Unfortunately, he did not study how the more recent eurozone crisis and certain propositions for a two-speed European Union have affected euroscepticism in the country. Frankowski’s presentation neatly filled this void. He explained how Poland’s relatively low GDP-per-capita, the plummeting number of Polish EU officials and the recent shift to the right in domestic political discourse might negatively affect the country’s attitude towards the EU. In presenting his counter-argument, he stressed that Poland’s impressive overall GDP growth (the second-highest in Europe over the last decade) points to prospects for deeper integration as opposed to differentiated integration. Frankowski also highlighted that Poland’s significant economic and political weight has not yet translated into a leadership role in Eastern Europe or beyond; will further integration facilitate this process? Once again, another scholar provided the answer. Having conducted interviews with Polish members of the European Parliament (MEPs), Paczesniak found that MEPs’ attitude and identity have changed noticeably as a corollary of their active presence within this institution. Exaggerating Russian imperialism, for instance, might be business-as-usual in the Sejm (the lower house of the Polish Parliament) but such behavior has made a laughing-stock of some vocal critics at the European Parliament. While the Europeanization of MEPs is hardly an exclusively Polish phenomenon, Paczesniak’s ongoing research underscored that it has a very limited effect on the behavior of domestic parties and parliamentarians. The limited Europeanization of the Polish political elite, therefore, carries pessimism regarding Poland’s increasing role in the EU. Last among the lecturers, Gagatek moved beyond the specifics of the Polish case and compared the legitimacy, organization and decision-making processes of domestic parties to those of Europarties, such as the European People’s Party (EPP). Gagatek observes similarities between domestic parties and their European counterparts in these processes, claiming that they are causally connected: The substantially different socialist and Christian Democrat party structure in the 1970s was replicated among the two largest Europarties, which is why the Party of European Socialists (unlike the EPP) has strictly built on internal consensus in its decision making. So, is there anything special about Poland? Maybe… in any case, Poland’s economic and political weight merits a growing interest — and the relatively high turnout for the day-long event confirms the recognition of this fact among the general public.